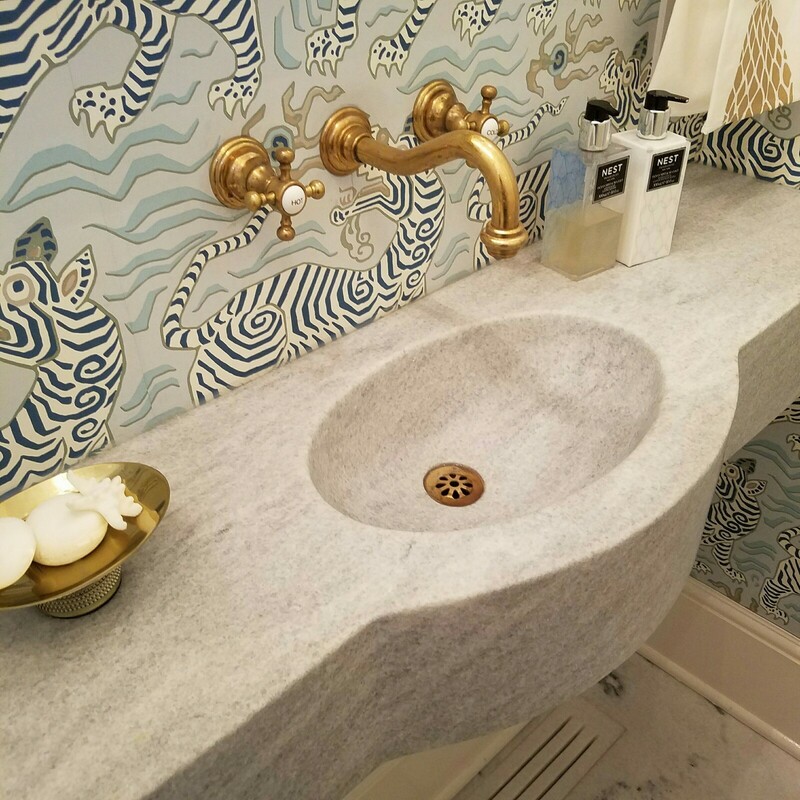 When a client wants a look no one else has, a custom stone sink makes a powerful design statement and can elevate the richness of any bathroom or kitchen. 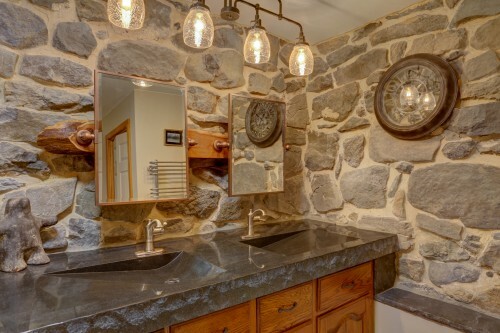 From a rustic modern sink to a hand chiseled double vanity (in a barn, no less) to a formal traditional marble powder room, natural stone sinks are where fabricators can shine, and maybe show off just a little. 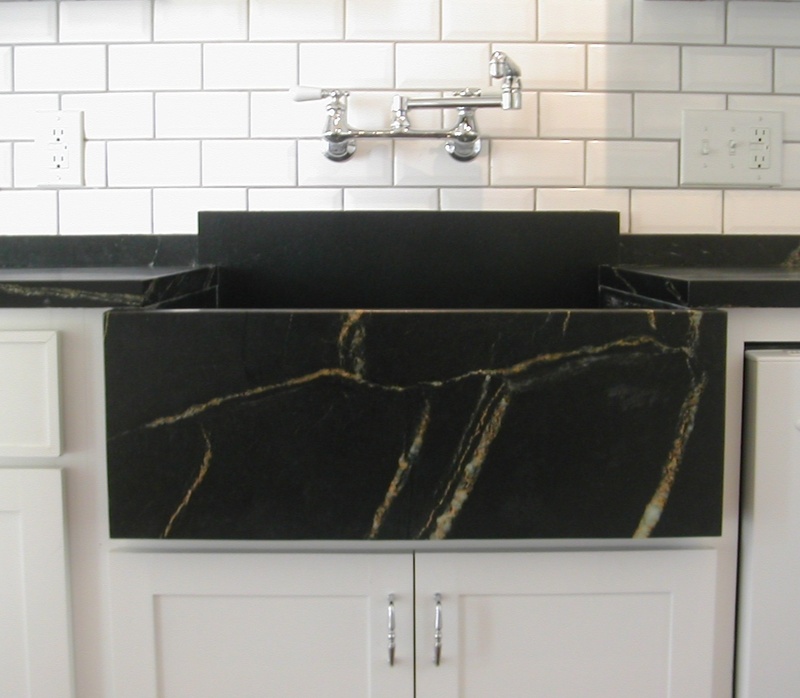 Today we’re profiling sink fabrications in Alberene Soapstone, American Black granite and the US marble White Cherokee. 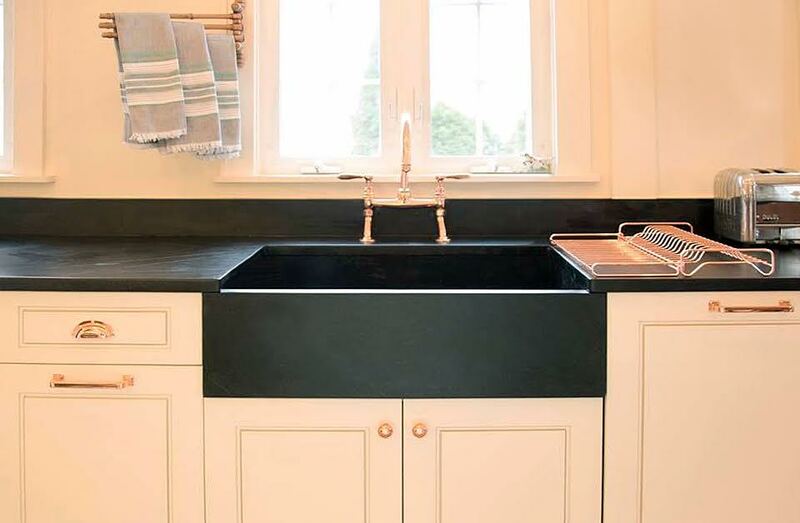 Alberene Soapstone has been mass-producing large utility sinks since they were a mainstay in turn of the century households and industrial buildings. In brownstones, rowhouses, urban centers and suburban homes across the U.S. these slop sinks were used for doing laundry, bathing children, and even mixing harsh chemicals in science labs. With the passing of time and the changing of trends, homeowners are back to inheriting these iconic soapstone sinks and designers are seeking them out for their own projects. He starts each project by taking dimensions to properly custom make each sink to every homeowner’s wants and needs. The standard construction of his sinks are tongue and groove. This means that after the five parts of the sink are cut - a back, front, bottom, and two sides - he creates a dado, which is an interlocking mechanism that holds all the pieces together. “Dadoing has a lot to do with wood parts, but I actually do it to my stone,” he said. Once the pieces are dry fitted together, the sink bottoms are pitched to a drain hole located at the sink’s center or any desired location. To finish up the project, he applies epoxy to the entire sanded sink to hold all the pieces permanently. “Even though the dado will hold it together, it won’t hold it together permanently. I put epoxy in all these dados and clamp it overnight. The next day we flip it over on the back side and epoxy the bottom very thoroughly because the bottom is where you want a lot of the strength.” Tauber finishes each sink with soapstone wax or soapstone oil, and it’s ready for installation. A true American product, this black granite is quarried in Elverson, PA. not far from Frank Lesher of Lesher Natural Stone, Quartz & Tile. He and his team just recently completed an American Black granite double sink vanity for a remodel of a historic 19th century farmhouse / barn in rural Pennsylvania. American Black granite has a deep black background with a pronounced, white linear veining giving it a marble-like appearance with granite's durability. This high quality, extremely durable stone can be polished, antiqued, honed, or water jetted. “The decision was made early on to specify a 4” thick slab so that the sinks could be carved out of a solid block while complimenting the old stone walls,” Lesher said. To preserve some of the older elements in the home and maintain the building’s character, the homeowners refinished the floors, used ash trees from their backyard for an addition, and purchased furniture from architectural salvage stores to pair with their new custom vanity. 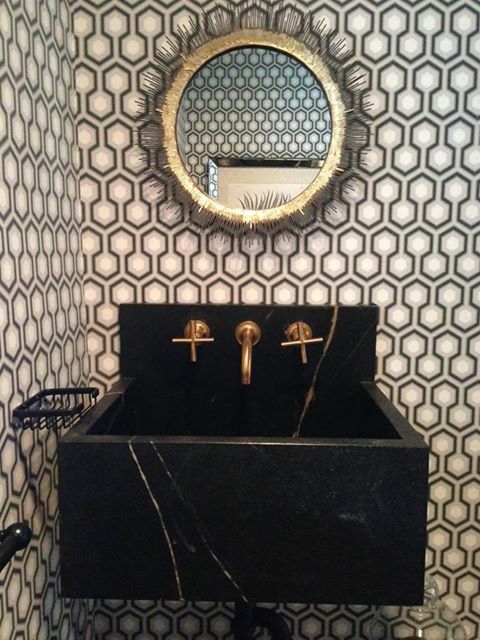 Keeping the feel of the rough face of the walls was the inspiration for a rock edge on the vanity. To complete this project, Lesher’s shop manager, Jim Good, hand chiseled the rock pitch edge of the vanity. 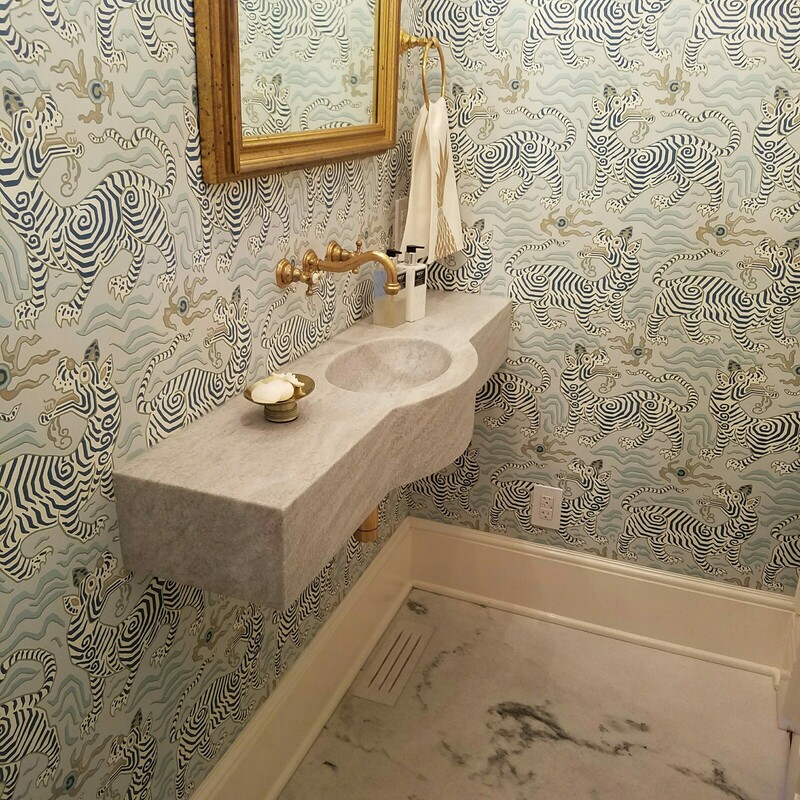 In Charleston, SC fabricators at Tile & Stone Design Studio fabricated a modern carved marble sink for some antique inspiration, making a tiny bathroom into a dramatic space. Showroom manager Sarah Miles explains how the design by architect and designer Beau Clowney and drawn by Kate Campbell at Beau Clowney came to be. “The architect and designer found a photo of an antique marble sink that they used for the inspiration, but the top was too wide for the space and not long enough. They contacted me to see if we could create a custom top,” Miles said. The size of the tiny powder room presented a challenge. “We had a very narrow space to work with so the size was very important. We made multiple templates and tested them at the house to make sure the door had clearance and you could still move about the room comfortably,” Miles said. One of the challenges to fabricating a carved sink in a custom size is getting the right block size to prevent significant waste. “The one thing I want to say is how easy it was to work with Polycor on getting this material. We did not have to buy a large, over-sized piece that we would have a lot of waste with,” Miles said. 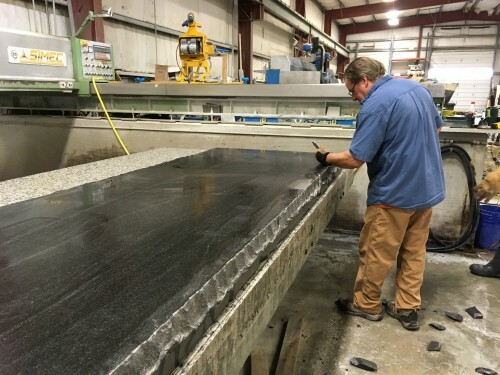 Polycor operates a zero waste quarry in Georgia and is able to cut blocks to size on demand. 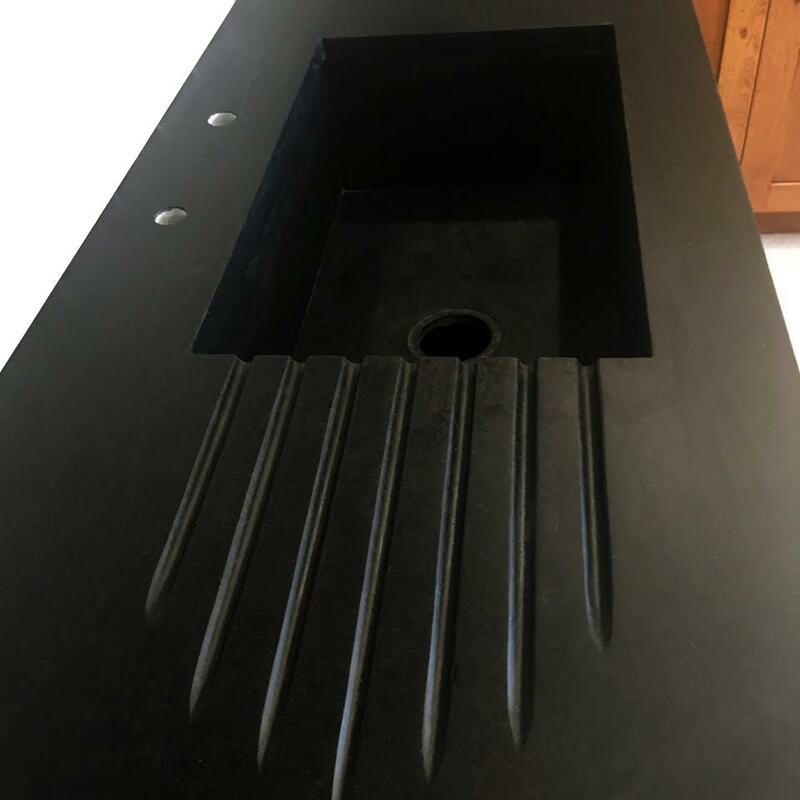 A custom natural stone sink, whether carved or constructed, is a high end upgrade that fabricators can offer their customers to set themselves apart from the competition. Both homeowners and designers should know that these sinks have heritage value, often outliving their first owners. I just found a double trough soapstone sink circa 1890’s at a high end salvage shop in New Jersey. 120 years later all it needs is a fresh coat of wax to make it the centerpiece of a rustic modern design. It goes to show you that quality materials and skilled craftsmanship create lasting design. 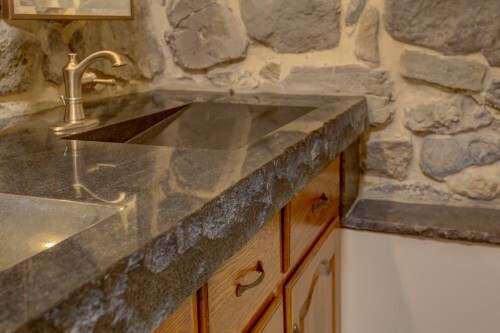 You can see more custom sinks here in our Soapstone Design Image Gallery. Download it for help with your next client meeting.